Despite being outplayed by Bayern Munich for long periods in their International Champions Cup match in Shanghai on Wednesday night, Arsenal steals a victory on penalties. 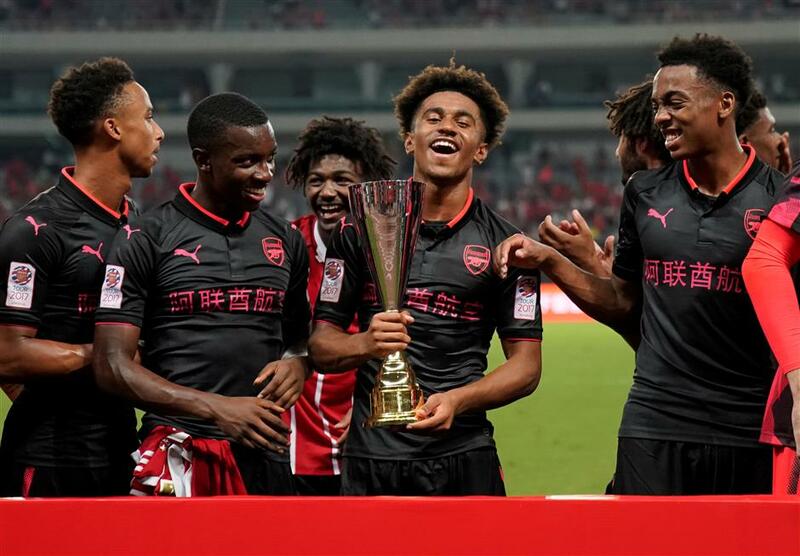 Arsenal players celebrate with the trophy after beating Bayern Munich on penalties in their International Champions Cup preseason match at Shanghai Stadium in Shanghai on July 19, 2017. Bayern Munich missed three kicks in the penalty shootout, losing 3-4 to Arsenal after a 1-1 regular-time draw in their International Champions Cup match at Shanghai Stadium on a scorching and humid Wednesday evening. Robert Lewandowski gave Bayern an early lead from the penalty spot seven minutes after kickoff. An injury-time equalizer by Arsenal’s Nigerian striker Alex Iwobi sent the match straight into penalties. Arsenal goalkeeper Emiliano Martinez, who came on for Petr Cech in the 72nd minute, denied attempts from Bayern’s David Alaba and Juan Bernat in the first and fifth rounds of the shootout, while Bayern midfielder Renato Sanches hit the bar in the fourth round. Both clubs put new signings in their starting line-up. Bayern manager Carlo Ancelotti started with James Rodriguez, recently signed from Real Madrid, Thomas Muller, Franck Ribery and Lewandowski, while Arsenal starters included newcomer Alexandr Lacazette as well as Mesut Ozil and Danny Welbeck..
Bayern, which dominated the match for long periods, was given a penalty seven minutes into the match when Bernat was brought down by Arsenal midfielder Ainsley Maitland-Niles in the box. Lewandowski scored the opener for the Bundesliga powerhouse from the spot. Lacazette almost got an equalizer for his new club five minutes later but for a brilliant save by Bayern goalie Tom Starke. Starke denied another one-on-one attempt by the French striker in the 31st. Arsenal captain Cech put on quite a performance in the latter part of the first half, denying a few on-target attempts, including a close-range shot by Rodriguez. A batch of substitutions was made by both sides in the second half, though the 39,200 weary and sweating spectators had to wait until the 94th for the second goal as Iwobi came to the Gunners' rescue with a last-gasp header. The English Premier League side then secured a 3-2 lead in the shootout after the first four rounds before Martinez saved the last attempt by Bayern’s Bernat for the victory. Ancelotti said the hot weather was not much of a problem for his team. The Italian praised the performance of Rodriguez, who “played at right along with Rafinha very well”. Arsenal manager Arsene Wenger said his team had to adapt to two different climates. Wenger said a victory against a strong team like Bayern boosted the team’s confidence. He praised substitute goalie Martinez for saving the penalties, saying he was planning to start with third 'keeper David Ospina in Arsenal’s next preseason ICC match against Chelsea in Beijing at the weekend to give more players time on the pitch. Bayern, meanwhile, plays AC Milan in Shenzhen, southern China. Borussia Dortmund beat Milan 3-1 in Guangzhou on Tuesday in the first match of the ICC China series.